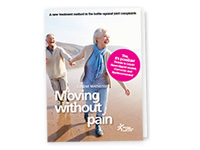 Our editors compiled a list of frequently asked questions regarding website content and the contents of the booklet “Moving without pain”. We are frequently asked: What is the name of the product with liquid Green-lipped mussel, Curcumin and Blackcurrant leaf and where can I buy it? How much does it cost? Do I need a prescription? Products with Green-lipped mussel and/or Curcumin and/or Blackcurrant leaf are available at pharmacies, health food stores, or drugstores. You can also order it online through multiple channels. The price varies for each brand and sales outlet. However, as managers of Movingwithoutpain.com we are not permitted to recommend specific brands or retailers. We also do not sell any products ourselves. If you look up the ingredients online via a search engine e.g. Google (specifically searching for liquid Green-lipped mussel with Curcumin and Blackcurrant leaf) you will definitely find options. We cannot (are not allowed) mention a specific brand in a general health information brochure. Is the product with liquid Green-lipped mussel, Curcumin and Blackcurrant leaf reimbursed by health care insurance? Can I take the product with liquid Green-lipped mussel, Curcumin and Blackcurrant leaf together with my other medication? You can check with your doctor to be sure that you can eat everything. If for some reason you cannot eat molluscs or turmeric, then this product is not suited for you. How about scientific research into the drug with liquid Green-lipped mussel, Curcumin and Blackcurrant leaf? For an answer to this question, it is best to ask the manufacturer of the product. We do not have the most current information for all products on the market. How long should I continue to use the liquid Green-lipped mussel, Curcumin and Blackcurrant leaf supplement? Initially you should continue treatment for try it at least 80 days to see if it works for you. If it has not helped (or not clear enough) within those 80 days, you may as well stop: continuation makes no sense. If it did work, you could then continue with a lower dose. For most people, this maintenance dose is necessary to prevent the return of the symptoms. However, you are free to experiment: each person is different and maybe maintenance is not necessary. When the complaints do come back, it is advisable to revert to the build-up dose period again until the symptoms have reduced. I do not have osteoarthritis but another joint disease. 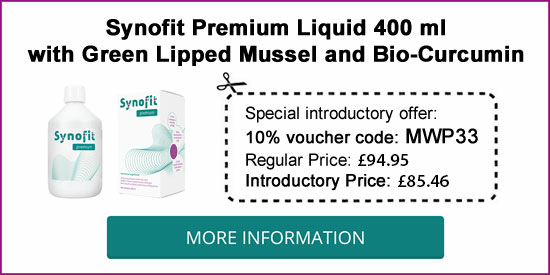 Could the product with liquid Green-lipped mussel also be of help to me? Due to the small number of these examples, we cannot predict whether this also applies to larger groups of people with these disorders. Therefore, we are unable to provide you with a complete answer. A Belgian study conducted further studies for Fibromyalgia only. Although the group of participants was small, the results gave no reason to further investigate the effect of the liquid treatment on Fibromyalgia. Of course there is no harm in trying it! And in case you tried it, please let us know your experiences, so we can provide others with good advice! 80 days is the advised trial period; if it has not helped within that period, then unfortunately proceeding usually makes no sense. I have diabetes, can I safely use liquid Green-lipped mussel, Curcumin and Blackcurrant leaf? Occasionally there have been users with diabetes who reported a change in the sugar level directly after usage. That could be due to the presence of natural sugars in Blackcurrant leaf. Others noticed nothing here. It is therefore strongly recommended to monitor blood sugar levels closely at first. Ask your question to the editors through this page.